There are very few identity theft protection services that I TRUST one-hundred percent. The reason for this is most of them require that a victim, or even someone who wants to protect themselves from identity theft, provide them with all their personal information. Some of them even require that you furnish them with a power of attorney, which is even scarier. In the wrong hands, a power of attorney would give the wrong person the ability to do a lot of damage to a name, or financial portfolio. In the era of outsourcing and phone banks, not giving someone else control over your name and finances is something worthy of consideration. We never seem to know exactly, who is being given access to this information, anymore. Most identity theft protection services take advantage of free services, which someone who had a fair amount of knowledge could do themselves. The problem is that a lot of people don’t have the knowledge, or want something that makes it easy for them. Truston addresses both these issues by allowing a person to keep their personal information personal and providing a user friendly platform to protect themselves, or if need be, recover from having their identity stolen. The protection services are always free and if need be, the recovery procedures are a lot cheaper than anything else I’ve seen on the market. The recovery services are only $10 a month, and only need to be purchased for the time frame they are needed. The majority of the services out there require a long-term commitment and have clauses (normally written in fine print) covering preexisting conditions. Because of this, Truston and it’s CEO, Tom Fragala have been named as a 2008 Hot Companies finalist by Silicon Valley Communications. 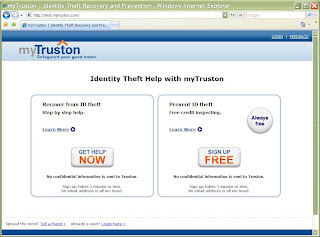 Truston, a provider of award-winning online services for identity theft protection and consumer credit management, announced that it has been named a 2008 Hot Companies finalist by Silicon Valley Communications. Truston was selected after a global analysis of information technology vendors around the world. Truston was chosen based on the “4Ps” selection criteria-Products, People, Performance, and Potential. The 2008 Hot Companies analysis encompassed companies in all areas of information technologies including security, wireless, storage, networking, software and communications. The Hot Companies 2008 evaluation process also assessed candidates for entrepreneurial spirit, seasoned executives with relevant experience, clear understanding of their IT market segment, products and solutions that are positioned to take advantage of the emerging market opportunities, well developed revenue-growth model and clearly planned expansion strategies. Tom Fragala, who has a background in the IT world was a identity theft victim himself, which prompted him to design a service that is both effective and privacy friendly. He has also spent a lot of time as an advocate for identity theft victims and blogs on the subject, here. Having known him for awhile through our mutual interests, I’ve done some other posts on Truston (which if anyone is interested) can be viewed, here. No user commented in " Truston Identity Theft Services recognized as a 2008 Hot Companies Finalist "